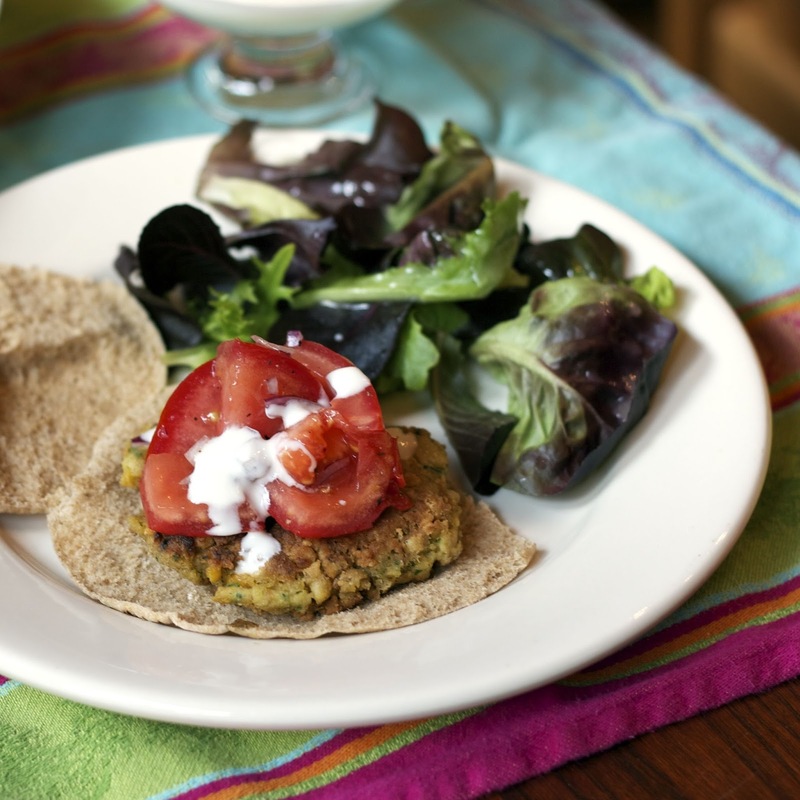 My family has always loved falafel and they were very happy when I gave up the pre-made mix and started making my own. The only problem I had with my homemade falafel is that the chickpea balls would not always keep their shape, so I decided to add egg. I also found that it was faster to cook 4 burgers than a bunch of falafel balls... the result is the Mediterranean Chickpea burger. This is an easy pantry dish to make in the summer. If you happen to see some nice lettuce and tomatoes by the road side pick them up. 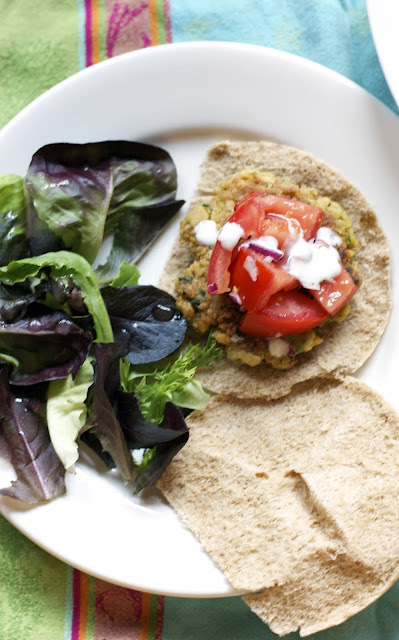 I keep pita bread frozen and cans of chickpeas in the pantry. I always have yogurt which is great to drizzle on top of this dish. If you have a little bit of red onion you got yourself a full fledged Mediterranean dinner. 1) Put chickpeas with a little salt and pepper in food processor with the minced garlic, spices, parsley, and egg. Pulse until it becomes a mixture of smooth and still chunky chickpeas, Then add the panko flakes and give it a few pulses. Shape into 4 wide flat burgers. 2) In a cast iron skillet heat the olive oil on medium high. Make sure the oil is good and hot before you begin cooking the burgers. cook until brown about 5 minutes per side. 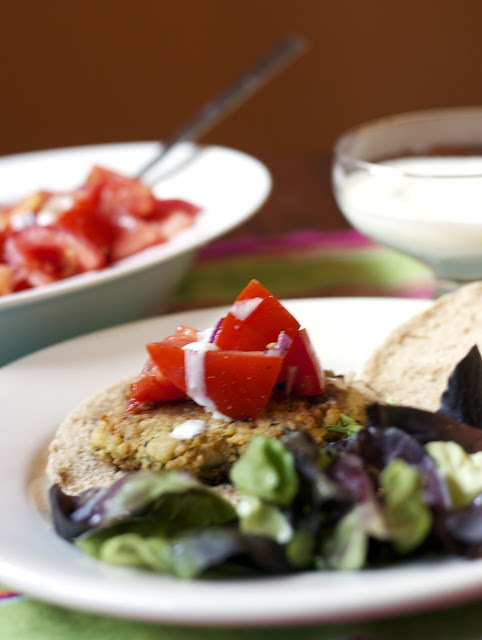 Serve on pita bread and garnish with yogurt sauce, lettuce, tomatoes and red onions. I've been in the mood to make burgers ! Thanks for this recipe Diane; it will be perfect. Enjoy it works well and it light. Diane, I am not only going to send this on to Emma but I am also going to give this a go myself. (Maybe I'll use a big, fat burger bun, however.) I already have ever single ingredient in my pantry or fridge so I am good to go. And, since my post this week is on cast iron cooking, I already have my cast iron pans at the ready. Well, I actually always have my cast iron pans at the ready. I love when the recipe stars align. I've been making black bean burgers lately - I need to spend more time with chickpeas. I love a good black bean burger too.. this is definitely lighter.